There is an argument to be made that Gordon Smith is the forgotten giant of Scottish football. Although his memory lives on with those lucky enough to have seen him play, recognition for his exploits as a player and for his unique acheivements seems to have slipped away. Yet his was a remarkable career: five league championships with Hibs, Hearts and Dundee. European Cup appearances with those three clubs, including semi-finals with Hibs and Dundee. He made more appearances for Hibs than any other player and, despite being converted into a winger, scored more goals for them then any other player. Five goals in one match from the wing remains a Scottish record. When Hibs feared age and injury had robbed him of his genius he got himself fit, joined Hearts and won the League and League Cup in his first season. When he felt the atmosphere at Tynecastle was diminishing he left, only to reinvent himself once again as the elder statesman in Dundee's championship winning side. Manchester United, Arsenal, Tottenham Hotspur, Aston Villa, Newcastle, Fiorentina and Vasco de Gama were among the clubs who tried to prise him from Scotland. In the late 1940s Matt Busby was willing to sign him for £40,000, Newcastle repeatedly offered Hibs a blank cheque. This was a career that Scottish football will never see replicated. Yet until now there has never been a biography published charting Smith's remarkable endeavours. 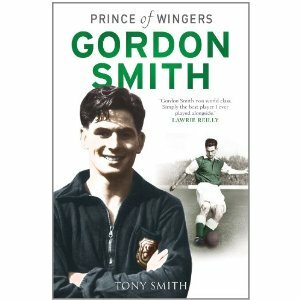 His son, Tony Smith, has set out to remedy that with Gordon Smith: Prince of Wingers. He's produced a fascinating account of a fascinating life. One of the reasons for Smith's continued lack of widespread recogniton was his insistence, both as a player and in retirement, of leading an intensely private life. Yet in a number of ways he was Scotland's first superstar footballer, the top draw in the days when 5000 fans would be attracted to watch Hibs play cricket on Leith Links. And, despite his craving for privacy, his life often reads like a prototype for the modern footballer. No bad behaviour but plenty of glamour. When footballers more easily identified with the working man Smith was driving a Porsche and holidaying in the south of France. Before million pound wages turned footballers into front page celebrities, Smith was friends with the jazz star Sidney Bechet, the golfer Bobby Locke, the singer Frankie Vaughan and war hero Douglas Bader. When footballers still took their holidays at Butlins, Smith was taking time out from his holiday in Cannes to work as an extra on an Alfred Hitchcock film and being invited out for a meal by Bridget Bardot. For someone who grew up in Montrose at the time of the Great Depression and who played all but a handful of his club games for teams based on Scotland's east coast this was a life less ordinary. And that's without the football. After impressing in a game against a Hibs and Hearts select, the Tynecastle club - the team he and his father supported - were desperate to sign Smith. But Hibs moved quickly. Manager Willie McCartney, a former Hearts manager, signed him on a Sunday. On the Monday evening, in borrowed boots, he scored a hat-trick in a derby. Most present had expected him to play as a trialist for Hearts . And so began a career that seems incredible to those of us weren't there to experience it. The skills, the plaudits, the goals, the best of Scotland rubbing shoulders with - often beating - the best in England, Europe and the world. The development and blossoming of Hibs' Famous Five: hallowed still are the names Smith, Johnstone, Reilly, Turnbull and Ormond. The way he slotted into a Hearts team, a seismic city switch that seems to have been handled with remarakable magnanimity on both sides, and promptly won another league medal. The veteran at Dundee who was hero worshipped by his team mates and found in Alan Gilzean the perfect foil. The sheer appetite for football at the time seems incredible now: two legged cup ties decided only after two replays with the total crowd nudging 200,000, matches played on consecutive days, thousands filling stadiums for five-a-side tournaments, Princes Street Gardens mobbed to see the Edinburgh teams play head tennis. A lost age. But not all that long ago that links don't remain - Craig Brown played with Smith in that Dundee league winning side. Smith wasn't without his flaws. His great Hibs team had a shocking record in the city derby - I suspect they'd argue that they saw Rangers as the bigger rivals at the time - and he rarely flourished in a Scotland jersey. Willie Waddell of Rangers was preferred for most of Smith's sporadic international career, although he did captain the side during a tour in 1955. Perhaps not coincidentally this responsibility was coupled with his most sustained run of international form. He wasn't without complexity off the pitch either. A worry with a biography written by a son is that it will gloss over such issues and to an extent that is the case here. It would have been interesting to have a more thorough exploration of a couple of hints of certain unpopularity in the football world. Was that inspired by jealousy - bonus payments, private interests, a whopping testimonial purse and unspecified stocks and shares dealings with his close friend Waddell left Smith rich beyond the dreams of many contemporaries - or by a distrust of a man whose shyness was often covered by a defensive aloofness? And given that shyness, that dislike for the public aspects of a life led in the public glare, how did Smith end up befriending Locke and Bechet, meeting Bardot and Mohammed Ali, developing such close personal bonds with Stanley Matthews, Matt Busby and countless others? Or maybe it's best not to know, to just explain it away as some inexplicable aura of greatness that attracted those who recognised or shared his genius and scared those who would be forever in his shadow. The book still rattles along, perhaps surprisingly so given the detailed coverage of each of his seasons in professional football. Although, as many a gentleman of a certain age would tell you, Gordon Smith always did make the game exciting. In a moving epilogue Tony Smith chronicles his father's Alzheimer's hastened decline. This is a book written by a son who had the pain of losing his father twice. If his writing goes some way to helping Scottish football rediscover the greatness of Gordon Smith then this book will be a fitting tribute. > There's a fine collection of testimonials from a variety of contributors at the beginning of this book, providing an insight into how his contemporaries, rivals, teammates and supporters saw Gordon Smith. To Jim Baxter he was "my hero", to Lawrie Reilly "one of the greatest players of all time," to Alex Ferguson - once an opponent - "a dream footballer", to Alan Gilzean "absolutely terrific." For Bob Crampsey Smith's five titles with three clubs amounted to the "the greatest individual accomplishment in the entire history of Scottish league football." My favourite is one from a supporter, Wattie Robb. Wattie, who I knew vaguely towards the end of his life, might well have been the greatest Hibs supporter of them all. His mantra about Gordon Smith never changed: "I would say he was a better footballer than Pele - I really believe that." Without doubt the greatest Hibs player of all time. Thanks for the comment, Patrick. And from everything I've read and heard it seems impossible to argue with that!